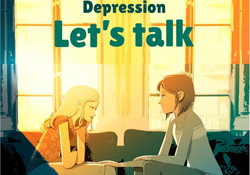 This year, World Mental Health Day will also mark the launch of WHO’s campaign for World Health Day 2017, the theme of which is “Depression: let’s talk”. Although depression is treatable, about 50% of cases of major depression still go untreated. Depression is a major challenge to all health systems in the WHO European Region. Its high personal, social and economic costs and the high proportion of people who are not receiving any treatment, despite the availability of cheap, effective care, underscore the importance of overcoming this challenge. The United Kingdom has experience in treating depression through cognitive behavioural therapy (CBT) – a talking therapy used to treat depression and anxiety, and this effective initiative can be replicated in many countries. CBT is a structured approach that helps people change the way that they think and behave, so that they are better able to manage anxiety and depression. England significantly increased the provision of evidence-based talking therapy to people with depression and anxiety through a large-scale programme funded by the National Health Service, “Improving access to psychological therapies”, in 2008. By 2012, the programme had treated more than 1 million people, of whom 680 000 completed the full course of treatment. The recovery rates of the 680 000 people were consistently above 45%, as was expected from the research evidence. A total of 4000 new practitioners were trained to deliver the various types of talking therapy using a nationally agreed curriculum and quality assurance system. An extensive evidence base demonstrates that CBT is as effective as anti-depressant medication in the treatment of depression. Implementation of CBT led to concrete economic gains in terms of employment attainment and retention, with more than 45 000 people moving off sick pay and benefits. There were also health gains, as recovery rates improved from 16% in the first year to 45% in the third year. Funding for the service continues, and it has been extended to address the needs of children and young people, people with severe mental illness and people with noncommunicable diseases such as diabetes and cardiovascular disease.